As we all know by now, this CD-ROM is based on a technology called True-X, developed by ZEN Research. Based in Israel and the States, Zen Research develops new technology for use in cutting-edge components for CD and DVD drives. The technology included in this drive includes optics, a detection device, and a high speed processor. So what does this technology do that makes it so different from normal optics and processors resident in a standard drive? To answer that question we must take a step backward for a moment. 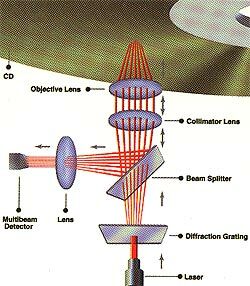 Previous CD-ROM technologies relied upon one highly-focused laser reading the encoded information off of the CD-ROM. In order to boost the X-rating of the drive the rotational speed of the disc had to be increased. Spin the disc faster and the laser is able to pickup more data per second. Based upon the Constant Angular Velocity (CAV) format; 72X Kenwood Drive rotates the disc at an essentially constant velocity. Data rates fluctuate in relation to where the laser is at any one moment. Traditionally, the closer to the inside tracks the lower the data rate achievable. This is because the disc must spin faster for the laser to process the same amount of data as at the outside edge of the disc. Enter the technology developed by Zen. Instead of rotating the disc above and beyond the physical limits by some act of magic, they have devised a means to read seven tracks concurrently. Those seven streams of data flow through a specially designed RISC chip and to your computer with no additional CPU-load. Technically speaking here is what occurs as your copy of Quake III spins up. A focused laser makes its way through a diffraction grating where it is split into seven discrete beams. These seven beams are spaced evenly to read seven tracks on the CD. As the beams make their way to the disc they pass through a beam splitter and objective lens. Conventional technology takes care of the focus and tracking, and the returning beam is read by a special multi-beam detector array. With the laser light converted to electrical signals the next step in Zen's technology steps into the light. A purpose built parallel processor (ASIC) takes all seven feeds of data and processes the optical signals at the same moment. The end result is that a massive amount of data is processed quickly, without overloading the CPU. The parallel processing ASIC integrates multiple channels of analog front end inputs, DPLL, data encoding, error checking, parallel to serial conversion, and UDMA ATAPI interface protocols. As a result data flow is through the dedicated processor and the CPU is free to do more important tasks. Transfer rates of 6 to 11Mb/s are achievable currently with this Zen technology, and the company has plans to up that number even further with the introduction of Blue laser optical hardware.